Frederic Zenhausern is a pioneer, but he works in the future. He’s a research scientist, but his success depends on his business acumen. His connections to the local community are vital, but his biggest successes are with global communities. As director of the University of Arizona’s Center for Applied NanoBioscience and Medicine, Zenhausern, PhD, MBA, directs a dozen researchers to create platforms that can translate molecular analysis into medical uses for better diagnoses and treatment of diseases. In his world, there are no borders. Zenhausern, who was born in Switzerland and earned his BS and PhD from the University of Geneva, uses his many international connections to attract business to the Center. He also is a professor in Basic Medical Sciences at the College of Medicine. The heart of the Center’s work is developing platforms to analyze molecules that carry genetic instructions to the body. 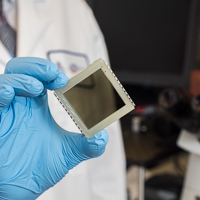 At the Center’s state-of-the-art facilities, scientists build devices on a micro- and nano-scale for academic, clinical and industrial users. Electrical and processing engineers on staff create circuit board prototypes, electronic assembly bioassay kits and plastic devices. The team of biologists provide molecular biology research and assay chemistries development. The Center will relocate soon, to the Biomedical Sciences Partnership Building in downtown Phoenix on the College of Medicine campus. The 245,000-square-foot research building will be the new hub for health care and scientific innovation when it opens in early 2017. Working with the United Kingdom Forensic Science Service to develop and commercialize the first platform technology of rapid DNA testing for mobile human identification. It was used by police forces in Germany, the Netherlands, Austria and the United Kingdom through a program sponsored by the European Union. Providing optical biometrics technology for a global corporation that is developing next-generation fingerprint identification and security systems compatible with Interpol standards. Developing a simulated human gut on a chip for performing new research linking the human microbiome to health, nutrition or medication, under a project funded by the Luxembourg National Research Fund and partners at the University of Luxembourg. Collaborating with Columbia and Duke Universities to develop easy and inexpensive ways to detect pathogens and radiation exposure for guiding medical response in the event of a disaster or pandemic with funding from the U.S. Department of Health and Human Services. Exploring wearable technology for health applications and “smart” hospital rooms that enhance patients’ experiences with scientists from Nanyang Technological University in Singapore. Using particles beam technology with the Italian Centre of Oncological Hadrontherapy to personalize radiotherapy. Zenhausern said by looking at an individual’s molecular biomarkers, scientists can see how a patient tolerates a certain amount of radiation compared to another patient. Designing for the Defense Threat Reduction Agency, a paper-based microfluidic system that can be used in the field to detect biological threats with collaborators at Arizona State University and the University of Nevada. 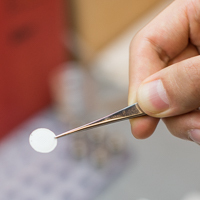 Developing new ways to collect blood that is minimally invasive and can control processing biofluids during transportation that can then interface with a mass spectrometer for screening small metabolites for early signs of disease. Innovating new materials for medical devices and other sensing technology through a decade-long partnership with the Mitsubishi Gas Chemical Company in Japan. Performing pre-clinical studies in cancer funded by several governmental and philanthropic institutions in collaboration with multiple health care partners in Arizona. Designing and manufacturing new polymer-based electrochromic flexible displays for camouflage and other consumer product applications for a high-tech company. Zenhausern said the international partnerships provide networking opportunities, diversification of resources and stimulate creativity among researchers. As a scientist with an MBA, Zenhausern is always looking to find ways to capitalize on his Center’s breakthroughs. His lab is not only involved in building platforms and technologies for diagnostic tests, but Zenhausern sees business opportunities in the way a specimen is transported from a person to a lab. 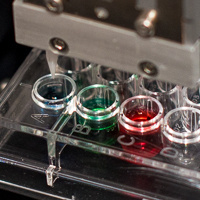 His researchers have developed packaging that begins processing a specimen — such as blood, saliva or urine — while it is being shipped for analysis. Doug Hockstad, senior director of tech transfer for Tech Launch Arizona, called work being done at the Center exciting and ground-breaking. Because of his business background — he earned his MBA from Rutgers University — and past entrepreneurial experience with the creation of four successful startups, Zenhausern knew to recover the intellectual properties and patents relating to the DNA test his Center developed after the UK government closed a forensic lab that was using the test. He established a new company, Whitespace Enterprise Corp., to expand the reach of the rapid molecular analysis to other systems suitable for the early detection of infectious diseases and other point-of-care diagnostics. “We developed the core platform and invented the full integration of the workflow process for rapid DNA analysis,” he said. “Now we can use it for a number of other applications” such as RNA, protein or metabolomics analyses. The projects the Center decides to take on must be sponsored through direct financing from corporate or government grants and contracts, licensing, philanthropic donations or in-kind contributions. The scope and price of its projects range from three to six months and about $50,000, to 10 years and more than $40 million for joint development partnerships. Staff scientists, faculty and students are participating in these projects, providing hands-on training and education to many young research investigators. 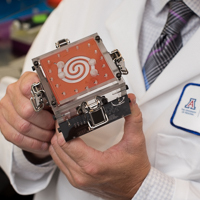 After a project is finished, depending on the contract, the device, kit or processing technique is retained by the University of Arizona, licensed by a corporate sponsor or accessible by the U.S. government. Some technologies have been transferred to the partner or company for validation, then mass produced for commercial distribution.